Improve your Arctic Edition JK Wrangler's look in seconds with a Mopar factory Arctic badge decal. This 5-inch by 4-inch silver, black and blue decal features the glaring eyes of a Yeti over a Jeep logo and the latitude and longitude lines for the North Pole. 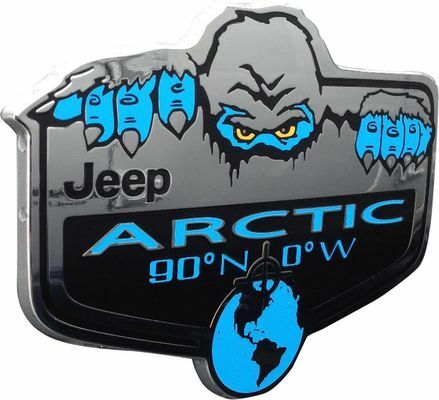 This self-adhesive, ultra-durable Jeep Arctic emblem comes on Arctic JKs, but it permanently adheres to any flat surface. Badge measures 5" x 4". The decals are beautiful and look great on my yeti. Only thing is they are a bit overpriced.